Get the look: Priyanka Chopra in her music video 'exotic' featuring Pitbull! Have you girls watched priyanka chopras latest music video featuring pitbull named exotic yet? She seems to be on a rage with her singing career but all her looks in the video were fab! She had a neutral look, a dark Smokey eye and this one which I’m recreating today which is a bronzy- purple Smokey eye. Bronze is a shade that compliments medium skin toned girl’s a lot so this look suited her a lot! Beauty Dosage 6 month anniversary giveaway – Win NARS,Benefit and much more! Tape your outer V. This helps to achieve that perfect cat eye shaped eye makeup she has on. And apply a black kohl on the outer area and smudge it really well until it becomes grey. 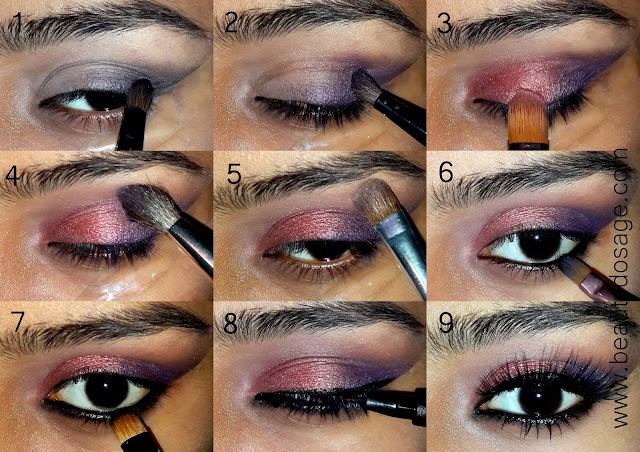 Using a dark purple shade, lend it over the areas you applied the black kohl and feather it towards the inner lid. Using a warm bronzy shade, wet the brush and apply it on the lid area and lend it in with the purple to incorporate the shades. Using a clean fluffy blending brush, blend the crease area really well. Use a matte creamy shade and apply it to the high points of your brows. Line your lower lash line with dark black kohl and smudge it lower with a synthetic brush. Line your upper lash line with a liquid liner. Pair up the look with heavy falsies as what priyanka wears. Awesome!! Wouldn't have thought of this pairing myself.